Conceptually, it is useful to separate hemostasis into three processes, primary and secondary hemostasis, and fibrinolysis. However, all processes are activated simultaneously (to varying degrees), and do not occur sequentially, in vivo. Also, hemostasis does not proceed in the fluid phase. It is restricted to cell surfaces (primarily platelets, endothelial cells and fibroblasts, but also leukocytes and erythrocytes), which has led to the new term: the cell-based model of hemostasis. Since hemostasis occurs on cell surfaces, each process involves cells and various enzymatic and non-enzymatic proteins that act as substrates or cofactors for the enzymatic reactions or agonists or facilitators (required proteins or minerals). There are also physiologic inhibitors for each aspect of hemostasis, which is important for localizing hemostasis to the site of blood vessel injury (and preventing it from spreading systemically, which results in disseminated intravascular coagulation or DIC). This section is organized by each process and information on the involved players, sequence of events, inhibitors, associated clinical signs, tests and disorders is given under each process. We have also given more information on physiology of the players involved in hemostasis (platelets – this is under physiology in the hematology section) and various physiologic and pharmacologic inhibitors of hemostasis. The important players (cells, proteins, cofactors and inhibitors) involved in each process of the cell-based model of hemostasis are summarized below (see also table summary). Proteins: vWf, subendothelial matrix protein (e.g. collagen), these are adhesive proteins that mediate platelet adhesion to exposed sub endothelial matrix. Facilitators: Platelet agonists such as thrombin, which is produced by secondary hemostasis (link between processes). Platelets also produce or release their own agonists with activation (e.g. thromboxane, ADP). Collagen is also a platelet activator. Physiologic inhibitors: Nitric oxide, prostacyclin (prostaglandin E12) – these are produced by endothelial cells. Secondary hemostasis: Formation of the fibrin clot via coagulation factors. Organized into intrinsic, extrinsic and common pathways for ease of interpreting hemostasis testing (but does not explain how hemostasis works in vivo). Cells: Fibroblasts (TF-expressing), platelets – activated platelets express phosphatidylserine (PS) and shed PS-expressing microvesicles. PS is a site of assembly of coagulation factor complexes that amplify and propagate thrombin generation. 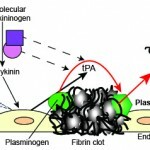 Note, that the current dogma is that platelets are the main PS-expressing membrane surface that supports thrombin generation, however in vivo studies in mice show that thrombin can be generated in regions away from the central core of adherent and aggregated platelets and can actually precede platelet adherence, suggesting that other cells, such as endothelial cells and likely leukocytes, may be important PS-expressing scaffolds on which thrombin generation occurs (Ivanciu and Stalker 2015). Enzymatic coagulation factors: Factors XI, X, IX, VII, and II. These are usually in an inactive form and must be activated before they can exert their enzymatic (cleavage) activity. 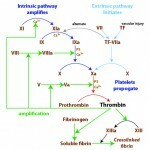 Note, that in contrast to the classic cascade model of coagulation, factor XII (part of the contact pathway) is not involved in physiologic hemostasis (data from in vivo mouse models indicates that factor XII is important in pathological thrombosis, leading to the production of inhibitors of FXII and FXI as potential antithrombotics (Renne and Gailani, 2007)). Non-enzymatic coagulation factors: These act as cofactors and as substrates. Co-factors are: Tissue factor (TF), Factors V and VIII. Both Factor V and Factor VIII, but not tissue factor, require activation by an enzymatic coagulation factor, usually thrombin or Factor IIa; Substrate for thrombin is fibrinogen. Facilitator: Bradykinin (stimulus of tPA release from endothelial cells) – this is produced from high molecular weight kininogen by the enzymatic complex of activated factor XIIa and kallikrein. Physiologic inhibitors: Thrombin-activatable fibrinolytic inhibitor, plasminogen-activator inhibitors-1 and -2, antiplasmin, polyphosphates, extracellular DNA (Gould et al 2014). In schematic depictions of clot formation, the physiologic clot is often depicted as a homogeneous structure, with platelets activated throughout the clot and showing similar degrees of activation. However, new data arising from in vivo models of mice in which fluorescent-labeled cells and coagulation factors are monitored in real time show that there is heterogeneity in both location and time of formation of the different end-products of hemostasis (activated platelets, fibrin formation etc). This “spatiotemporal regulation” of hemostasis has been reviewed (Ivanciu and Stalker 2015). To add to complexity of hemostasis, we are also beginning to understand that there are subpopulations of platelets with different roles in hemostasis and likely immune function and vessel integrity (Hoe-Tin-Noé et al 2011, Jenne et al 2013). For example, with hemostasis some platelets undergo sustained calcium release and express PS (and are called procoagulant) whereas others are more involved in aggregate formation with fibrinogen (Munnix et al 2009). A study of thrombi formed after minor vascular injury in murine cremaster arteries and venules showed that packed tightly cohesive P-selectin-positive platelets form a central core that is overlaid with activated but loosely associated P-selectin-negative platelets. Fibrin formation occurs largely within the core of highly activated platelets. Within arteries, fibrin extended into the adventitia, the core of P-selectin-positive platelets filled the defect into the vessel wall, with the “shell” of activated but P-selectin-negative platelets extending a small way into the vessel lumen. In contrast in venules, the core and shell extended further into the lumen and downstream within the lumen along the direction of vascular flow (Welsh et al 2016).